Well it is fall finally and the long weekend has past. I went to Ambleside beach last week for the low tides and found myself fishing amongst four other fisherman on the entire beach. There were no fish jumping which meant that all the stale fish had moved on or there was no fish. An hour before low tide I spotted two different pods of fining fish as they swam close to shore. I managed to hook my first coho salmon on an “AS POPPER” after trying for 6 years. First coho caught on an”AS POPPER” at Ambleside by Andre. Now I am convinced that fresh fish, no fishing pressure, overcast sky and persistence will produce fish on the surface even in our local beaches. I will continue to fish my popper again under these conditions until the end of the beach season and many years to come. 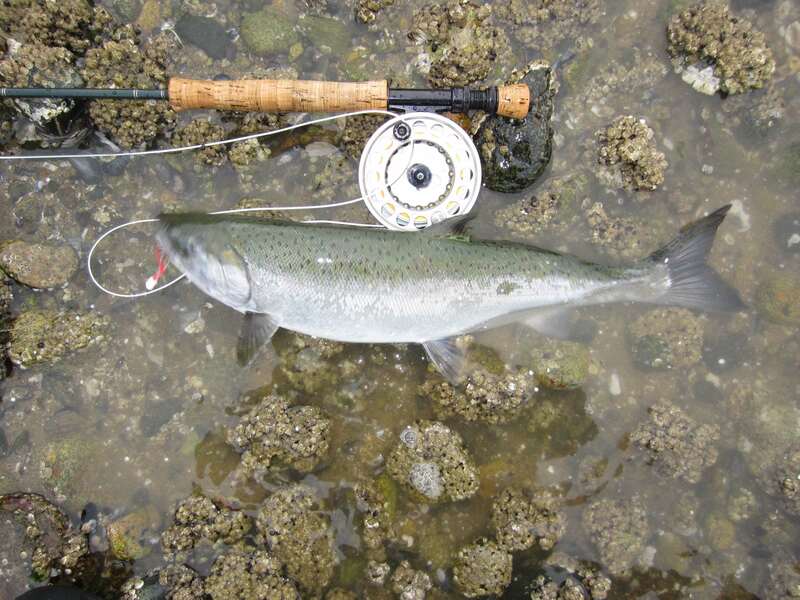 The pink salmon are still swimming around the mouth of the Furry creek, you may catch a few clean ones still but the majority of the fish are stale fish. It is safe to say that the pink salmon fishing off the beach is coming to an end for this season. The next good low tides are from the 22nd of this month. Don with his first coho off the beach! The chinook fishing this week, like the last five, continued to be amazing. This is without a doubt one of the best years for local chinook fishing we have seen in a long, long time. 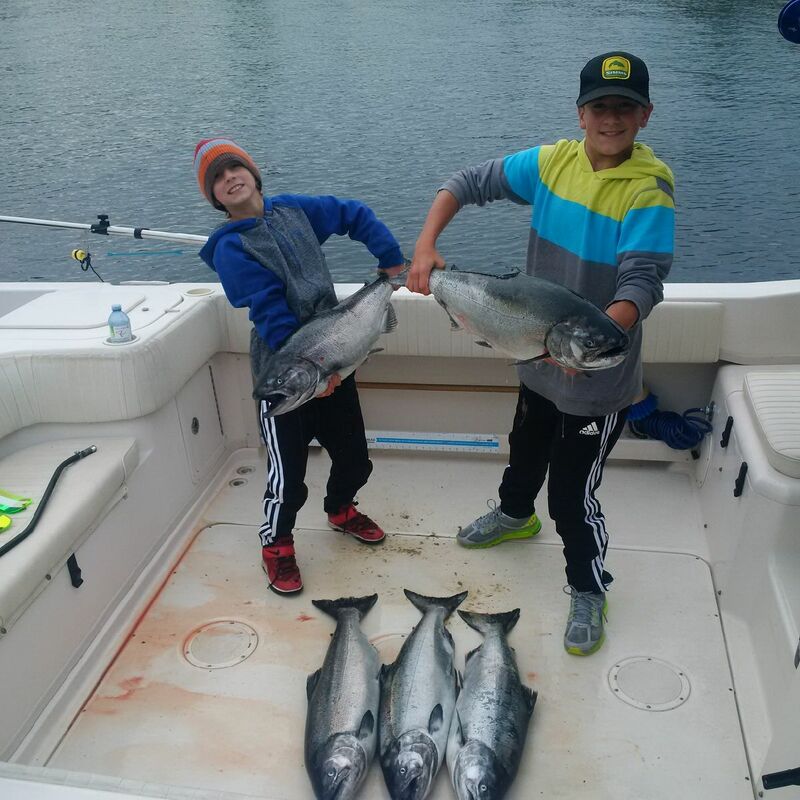 Sunday was a little slow as the orcas came through on Saturday night, but for the most part there were good to excellent catches of chinook all week from the Bell Buoy, North Arm, T-10, and South Arm. As mentioned in previous reports, the white chinook are now starting to show up. We kept 5 nice chinook on Monday’s trip and 2 were pure white, 1 was a marble, and 2 were red. There have been some big chinook this week as well. I saw a 35 weighed and another that was pretty much the same size. Both fish were actually reds, but for the most part the bigger fish this week have been white, likely headed for the Harrison, Chilliwack, or perhaps the Capilano. The average fish are much more modest with the most of them in the mid teens and a few in the high teens or low 20’s. Ben and Tyler with their catch from the S. Arm! The best depths haven’t changed much since last week, with most of the fish being in the 40-80 range on the downriggers. A few mornings we have hit fish at 20-30, and later in the day there were a few good bites in the 80-100 range, but 50-70 has really been the most productive area. Green glow, chartreuse glow and green onion glow flashers have all been excellent. A 6 foot leader to a herring on anchovy in a teaser head is the way to go. The best teaser head colours for us have been glow, green glow, or chartreuse glow or some combination of these colours. We have all sorts of teaser heads in stock with these colour combos. We just received a shipment of bait so we have 5.5 inch anchovies as well as the much coveted 6.0 inch anchovies as well as 5 to 6 inch herring and 6 to 7 inch herring. 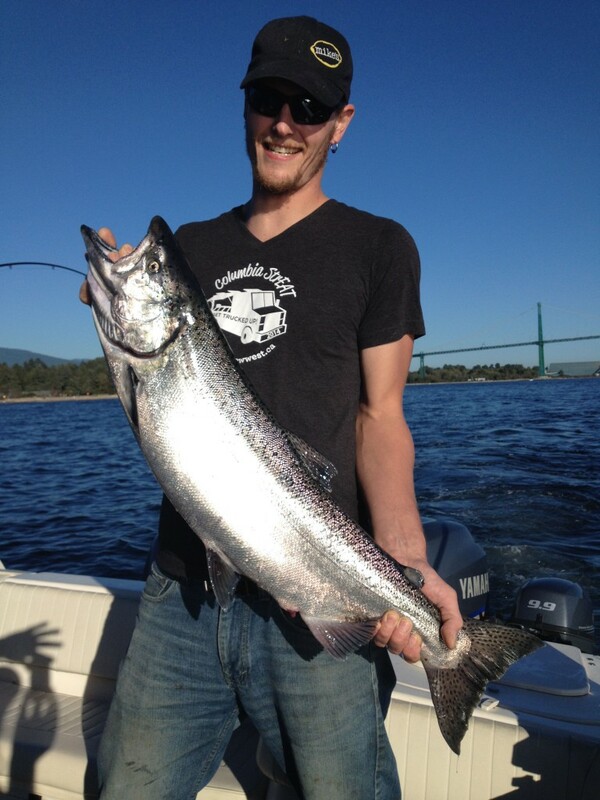 A beauty Capilano chinook landed by Eddie’s guests this week. Where are the pinks? A lot of anglers and customers have been asking me this question lately. The most recent email I have from DFO is the run is now forecast to be about 6.2 million. 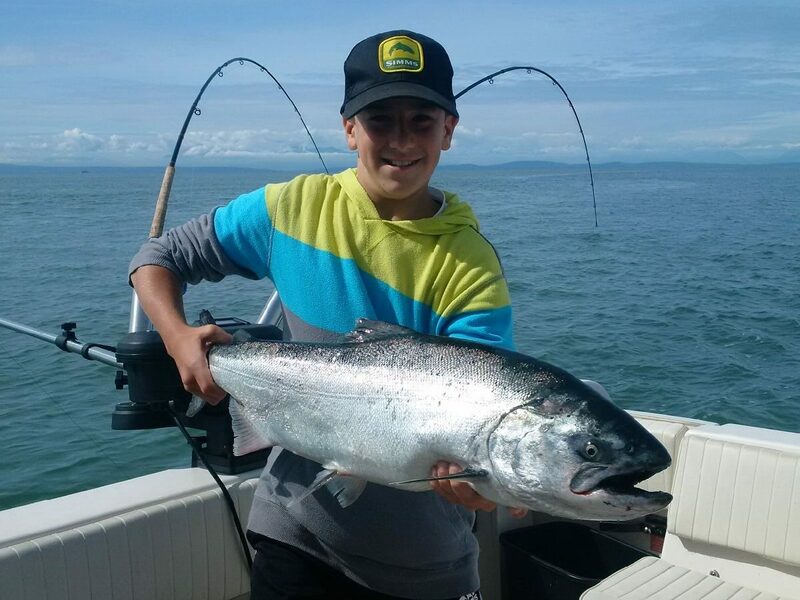 There haven’t been too many down at the South Arm when we have been there fishing or chinook, which is kind of nice as we are going through 2 to 4 packs of bait a day as is. I can only imagine how much bait we would go through if the pinks were thick. We are only hooking about 6 a day right now. That being said, most of the anglers that were spin fishing the Lower Fraser this past weekend with large pink spoons and spinners seemed to be doing pretty good. A successful trip off the mouth of the Cap! The Cap is starting to kick out a few fish on each flood tide now. The first big push usually shows up around the middle of the month so we do expect things to pick up this coming week. 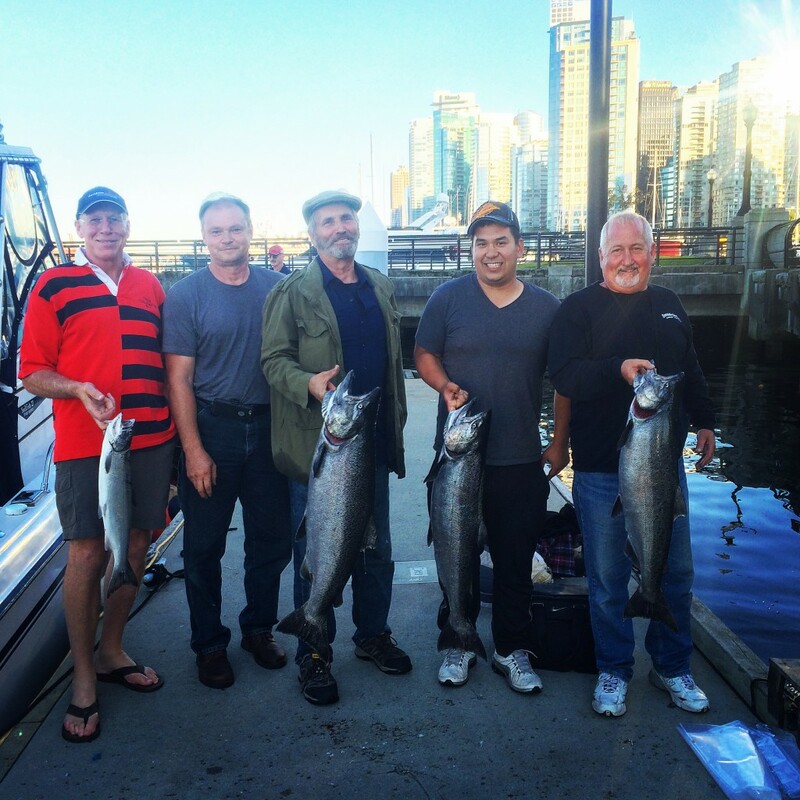 With the good fishing off the Bell and North Arm, the Cap has been relatively quiet for pressure recently as most anglers are enjoying the strong return of red chinook and the relatively easy access to them off the Bell, North Arm and T-10. There are still some coho and pinks off the Cap as well. 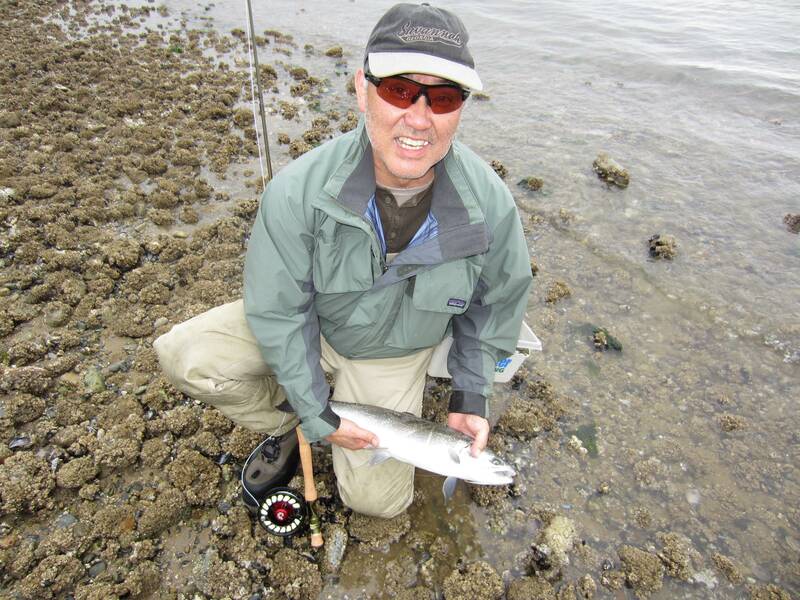 Andre was beach fishing there mid this week and some pinks and coho were hooked on the fly. A lot of the coho did go up the river with the rain last week, but there are still a few around. See you at the shop or on the water.